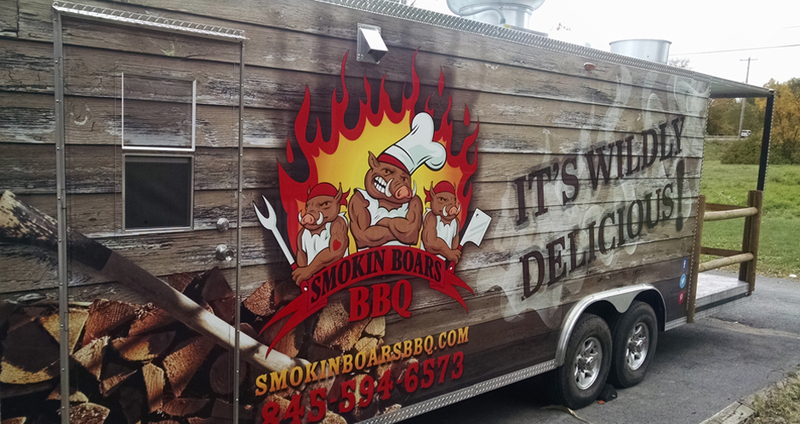 The mother-son team behind Smokin Boars BBQ truck is preparing to launch a brick-and-mortar operation along Route 28 in Phoenicia. Called Smokin Boars Cafe, the new restaurant will occupy the end unit of the commercial strip where Esopus Cafe and Deli shuttered a few months ago. Proprietors Gloria and Travis Buley have been hard at work gutting the interior between gigs with their food truck, which opened for business in April. The kitchen has been totally renovated. The dining room upfit is underway behind papered-up windows at the new space, which also includes an outdoor deck along the side and a few tables on a small porch. The decor centers on New York State and Catskills memorabilia collected on antiquing hunts, such as tables fashioned from doors that once belonged to an upstate brothel. “It will be all the stuff you grew up eating at your grandma’s house,” said Gloria, who owned and operated Hickory Pit barbecue in Shokan from 1998 to 2005. In addition to a variety of smoked meats and traditional egg-centered breakfasts, the comfort-food offerings will include homemade desserts such as bread pudding and pies. Longer-range plans include eventually securing a beer and wine license, and next summer, to host events in the parking lot, such as food truck rodeos and a farmers’ co-op. The barbecue trailer, which often perched on Route 28 across from the Woodstock Harley Davidson building on Fridays this summer, will continue to operate as a mobile food business. After a successful season with stops in places like Hunter Mountain, the winter-proof trailer is gearing up for cold-weather adventures. 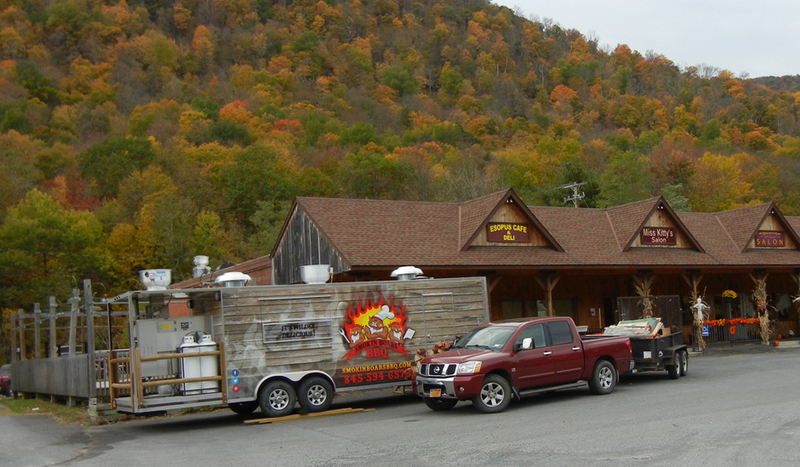 Find Smokin Boars Cafe at 5575 Route 28, Phoenicia. Tentative hours are Thursday through Monday 8 a.m. to 8 p.m.